You feel like you’re in another world as you enter the building and walk down a few short steps to the dining area. You can sit either in a back room, or preferably, the main spot, which is a strip of tables right alongside where the cooking is done. The narrowness of the space adds to the atmosphere. Depending on where you sit, you can see your food being prepared. You might even be close enough to reach over and grab your food once it is done and waiting for server pick-up. I had not been here since I was about ten. I hated it, and I can’t for the life of me figure out why. Nonetheless, here I was, back again, and I loved every minute of it. The menu and bearing witness to the preparation just screams freshness, and makes for a wonderful evening out. Everything is made to order, even the breadsticks, which took about fifteen minutes. The stuffed pizza comes with a warning on the menu, saying to allow at least twenty minutes for cooking, because nothing is prepared until you order it. We were not in a rush, so this is fine, but if you are hoping to grab a quick slice or meal before heading to a show over at Count Basie, you might want to find another place. However, if you have a bottle of wine and just want to relax, there is no better place. The breadsticks were perfectly crisp on the outside yet fluffy on the inside. They come seasoned with herbs and grated cheese, and an excellent tomato sauce on the side. They are almost like pizza crusts themselves and you really get the taste of the oven with every bite. As for the pizza, the selection is rather limited, as is the rest of the menu. 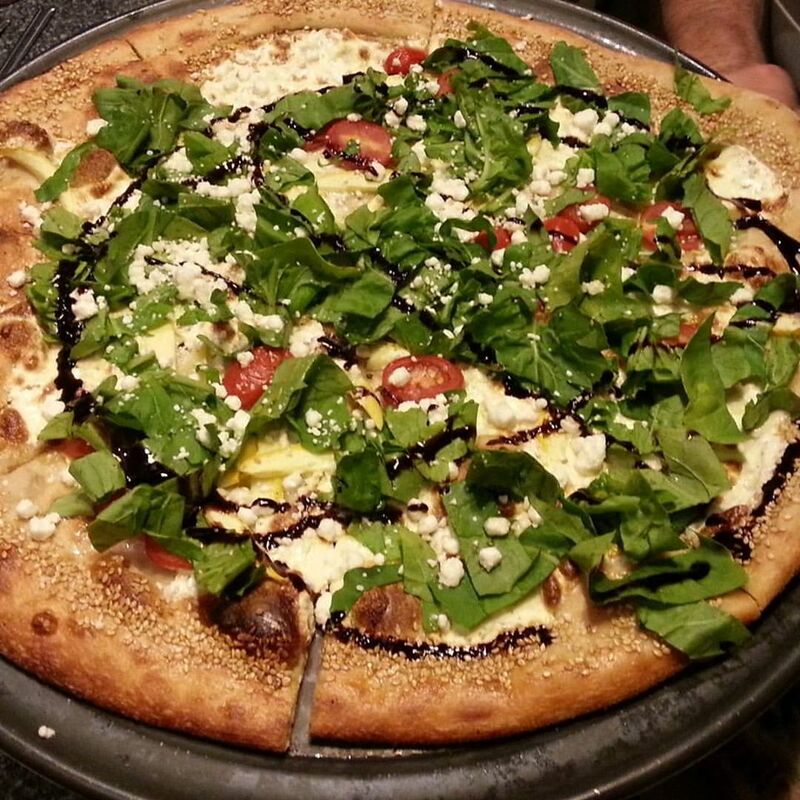 We ordered a large pie with arugula, squash, goat cheese, tomato, and balsamic vinegar. It was great. They must have added the arugula when it was done cooking, because it was not slimy, a gross mistake often made by pizzerias. These guys knew what they were doing. The ultra thin and crispy sesame seed-laden crust may be one of the best I’ve ever had. We also wanted to try a small stuffed pizza. One came up on the counter right next to us and it looked amazing. The menu recommends that the small is big enough for two, while the large can feed a family of four. Technically speaking, it’s not stuffed, as you will see below. There is no secondary crust. This is just a comment on labeling, because the pizza was terrific. Ours was “stuffed” with spinach and onion, and cooked without sauce (they give you cups of it on the side). Let me tell you that looks can be deceiving. When it arrived, I thought in no way was that big enough for two people. As I made my way through the first slice, my sentiment changed. Uh…yeah…this is enough for two. 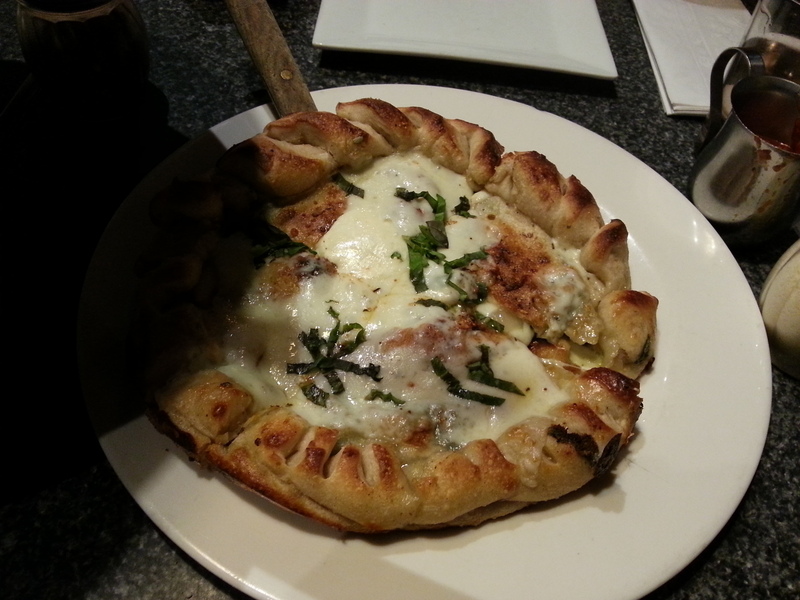 There is more mozzarella cheese on there than should be legal, and that crust is simply amazing, reminiscent of the breadsticks. It hits you like a brick and fills you up quick. If you are ordering this with an abundance of other food, you will have leftovers. Overall, I cannot wait to go back. Everything we had was superb. The service was also friendly and helpful, as I asked numerous times what certain things I saw being cooked were, and the waitress was happy to explain everything. I also have an unabashed hatred of oregano (I know, bad Italian, right?) and I have discovered over the years that it is actually quite hard to find a waitress/chef who will actually listen to my “no oregano” request, except when it is already in a sauce or seasoning—I just hate the additional sprinkle restaurants often fling onto the food in copious amounts. They nailed my request, and no oregano was to be found. Great job, Front Street, I will be back. 4 out of 5 stars. This review was previously posted here. Front Street Trattoria is located at 31 West Front Street in Red Bank, New Jersey.